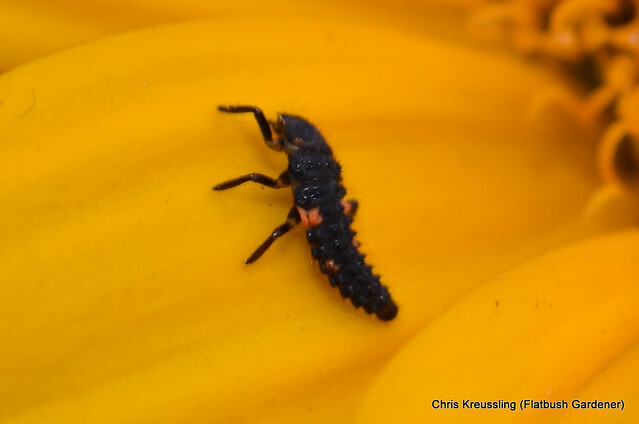 Flatbush Gardener: Coccinella novemnotata, nine-spotted lady beetle, aka "C9"
In 1980, when the bill was first introduced to make C9 our state insect, it was still common. It suffered a rapid decline through the 1980s. By the time it was finally designated the state insect in 1989, it hadn't been seen in the state for 7 years. Instead of introducing a bill to gloss over the extirpation of a species, let's reintroduce and restore C. novemnotata to New York State. Then our state insect would be a symbol to aspire to, and not simply an "error." Well, it may finally be time to do so. In 2001, 29 years after its disappearance from the state, C9 was finally found again, on Long Island. After years of research, Dr. John Losey and his colleagues at Cornell University have successfully reared C9 in captivity. And now, through the Lost Ladybug Project, they are making C9 larvae available to New York state gardeners and others. Here's one of them, freshly released in my garden, exploring Heliopsis helianthoides in my front yard. Stop using pesticides in the garden. Not just insecticides, but herbicides, fungicides, etc. Grow more native plants, and more varieties of them. Many insects feed on plants in their larval stages, e.g. : caterpillars, and can't feed effectively on plants with which they haven't co-evolved. A variety of native plant species also provides more flowers to provide nectar and pollen for adult insects. Choose plants that have clusters of small flowers, which will attract a larger diversity of insects than big, blowsy flowers. Leave piles of leaf litter, old logs and branches, standing dead stems of plants. These provide shelter for eggs, pupae, and adults. 1970: Coccinella novemnotata (C9) is the most common lady beetle species in the northeastern U.S.
1980: Nominated as New York state insect. 1980s: Begins rapidly declining. Speculation as to causes includes competition with introduced species, but no definitive answers have yet been found. 1982: Last seen in New York state. 1989: Designated NY State Insect, despite being apparently absent for 7 years. 1992: Last seen in the eastern U.S.
2000: The Lost Ladybug Project initiated as a citizen science project. 2006-06-15: Bill 2005-A06247 passes the NY State Assembly to change the state insect from Coccinella novemnotata, extirpated from NY State, to Coleomegilla maculata. October 2006: C9 re-discovered in Virginia, first time it's seen on the East Coast since 1992, 14 years. 2011-07-30: C9 rediscovered on Long Island, first time seen in New York since 1982, 29 years. Flickr photo set: Coccinella novemnotata, nine-spotted lady beetle, aka "C9"